Man, where do I get started? Ironically… that’s exactly how I feel on the days when overwhelm has my brain and body in a vice. 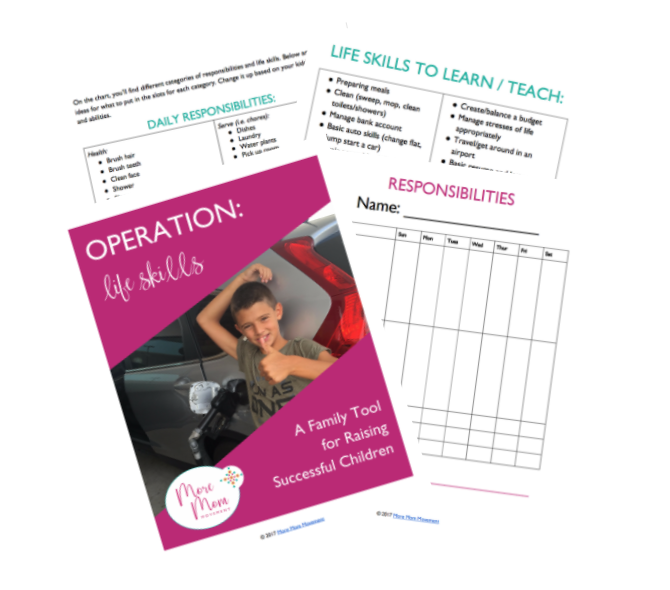 Whenever I am juggling too many things at work, a house that needs attention and the ever-growing sports/social schedules of my kids, overwhelm tries to work itself back into my life. 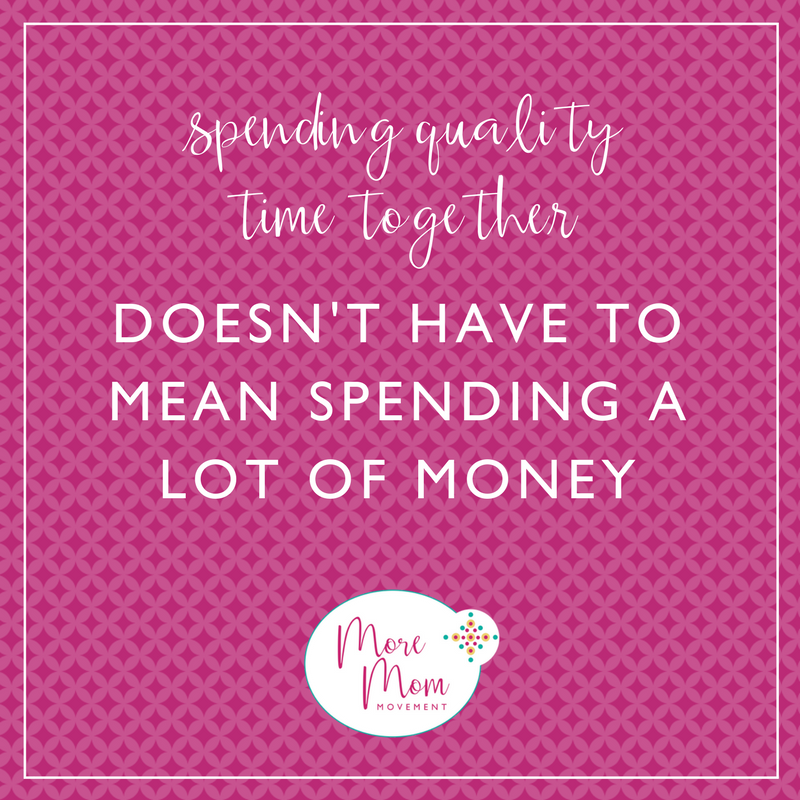 It’s a fact that it will happen to all of us, and even as someone who tends to be pretty dang organized, I find myself frozen at times with all the things to do. But it’s not about how you got into being so overwhelmed… but how you GET OUT of it that matters! 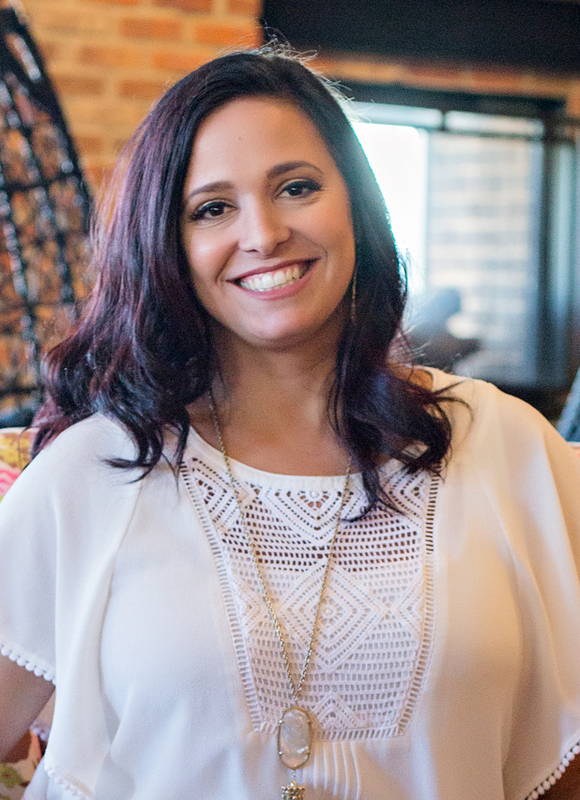 Here’s how I go from overload to mission accomplished… and kick overwhelm to the curb (and you better believe that in true Natalie fashion, you’re getting a list with numbers, bullet points and all! AHHH, I’m already feeling better). Braindump: Get it all out! Write down anything and everything that needs to be done! From shopping lists to picking up prescriptions to calling about a credit card… dump it all out to see it on paper. Prioritize and Organize: I’m talking lists on lists on lists baby! Figure out what is most important or what needs to get done first. -Calls: What can I get done from my phone? -Outside the House: What do I physically need to leave the house to accomplish? -Inside the House: What is in my surrounding area that needs to be done? -Computer: (Basically the same as our phone these days, right? But still…) What can I check off my list from my computer, such as paying bills, signing up for things, etc. Delegate: Asking for help is a good thing mama! More than likely you’ll see… your family WANTS TO HELP! 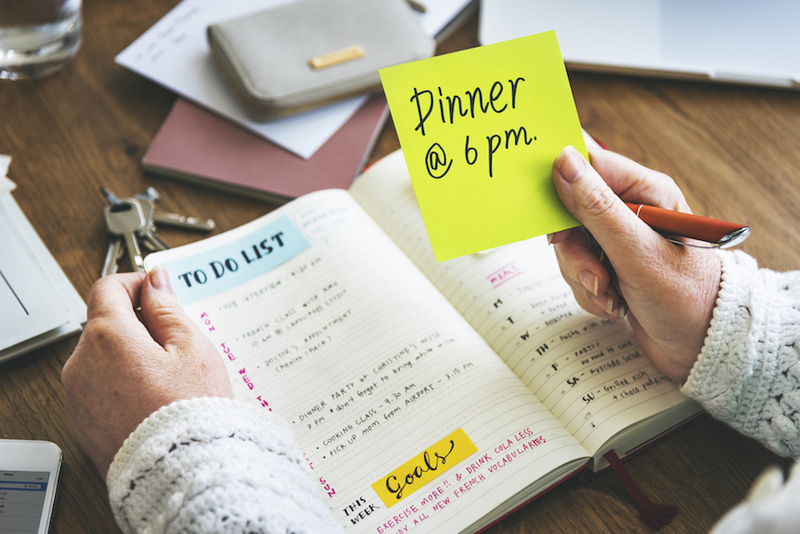 While not everyone is in this stage of their lives, for those that can… or those that aspire to be… outsource things to help your day run smoother! Hire a cleaning company, lawn service, etc. When in doubt… lean on your village! From your neighbors to your extended family and especially your friends, these people are your “village” and we all know what they say about it taking a village… they’re not wrong!!! Empty Your Buckets: Time to chip away! Now that everything is listed, grouped, delegated and sorted into their respective “buckets,” it’s time to tackle a few things at a time. Usually, I will try to pick 2 things from each bucket and show them who’s boss! Once I get the ball rolling and have accomplished a few things from each bucket, I tend to immediately feel more productive, organized and less stressed! Dead moments are the small groups of time throughout our days that aren’t filled with anything to do. For example: Often in the mornings I find myself with “dead moments” as I wait for the kids to get dressed and come downstairs before school. It’s what we do with these spare moments that can make or break us! Most people will use their dead moments to mindlessly scroll Facebook or watch TV. Not only is this doing nothing for our productivity, but it’s actually stealing valuable minutes from us! 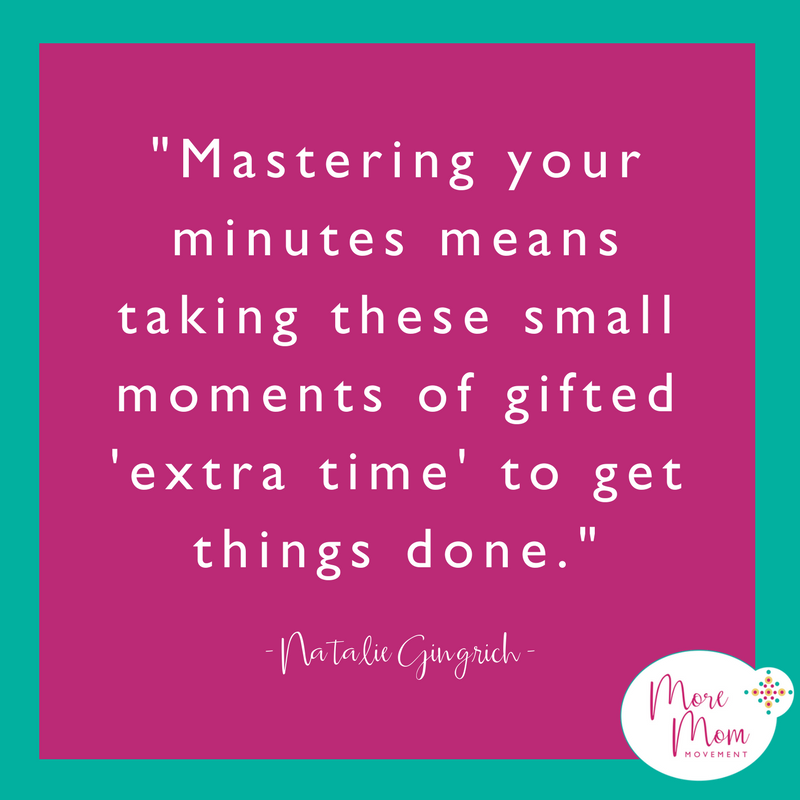 Mastering your minutes means taking these small moments of gifted “extra time” to get things done! In the end, I know that when I feel more productive it in turn makes me feel more successful and almost, dare I say… invincible! Automatically I feel like I can take on and tackle anything in my day. And let’s be honest, I LOVE feeling in control of my day and time. By using these tips, or any tried and true methods you have, we can all knock out the suffocating feeling of being overwhelmed and get back to focusing on what really matters in life! 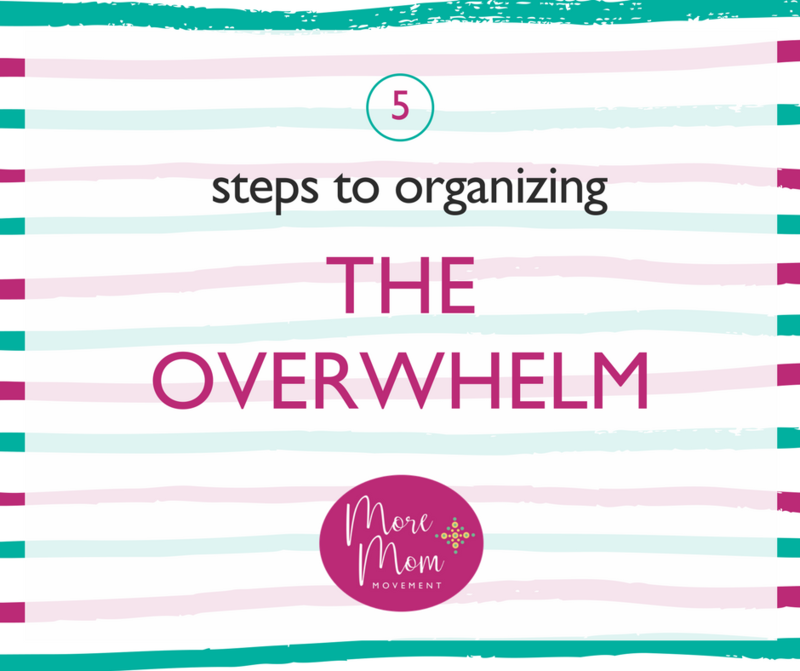 Do you have suggestions for organizing the overwhelm? Join us in our Facebook Community and share your tips with the More Moms! You’re welcome… so glad it was helpful!